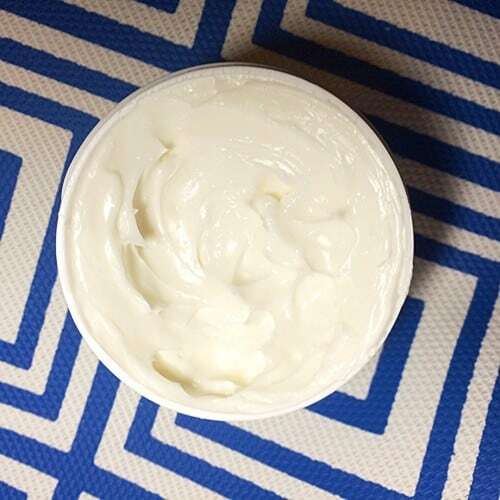 Era Organics Complete Moisturizer Review: Superfood for your Skin! You are here: Home / Lifestyle / Beauty / Era Organics Complete Moisturizer: Superfood for your Skin! This conversation on superfood for your skin was sponsored by Era Organics . View our disclosure policy here. As someone with eczema and psoriasis I find myself constantly searching for the best moisturizer for my dry and sensitive skin. I tend to go for products with natural ingredients, as I have found that they are much gentler on my skin. I was very happy to discover the Era Organics natural skin care line, made for all skin types and all skin conditions. I read a little bit about the company and was pleased to learn that Era Organics is a US-based family-owned company. While their top of the line ingredients are sourced from all over the globe, their skin-care products are made and bottled right here in the US. Era Organics products range from a natural baby balm to sulfate-free shampoo. While I would love to try their entire product line (well, maybe not the baby balm) I started with just their moisturizer. Era Organics Complete Moisturizer, a face and body cream, is packed with the finest natural ingredients. It contains organic aloe vera, manuka honey, MSM, coconut oil, shea butter, blue green algae, olive oils, cocoa butter and hemp seed oil with vitamins A, B, C, E. It does not contain any fillers, parabens, alcohol, of fragrances. Its hypoallergenic formula is perfect for everyone and all skin types: dry, oily, or combination. It is non-greasy and non-comedogenic (meaning it won't clog pores). The formula is especially ideal for someone like me with sensitive skin. When I first opened my jar of Era Organics Complete Moisturizer I noticed the thickness of the cream. But even though it is a thick cream (like the consistency of cold cream) it goes on smooth and feel light on my skin. I have found that a little bit goes a long way when applying the moisturizer. I just massage a small dab into my skin and my dry skin immediately absorbs the cream. My skin is left feeling soft, smooth, and residue free. It is as if my dry, thirsty skin drinks the nutrient-rich cream right up. I have found that Era Organics Complete Moisturizer is great for my face, but also great for my various dry patches all over my body – from my elbows to my heels. I am looking forward to trying other Era Organics products in the future, especially their Revive Microdermabrasion Face Scrub & Mask. 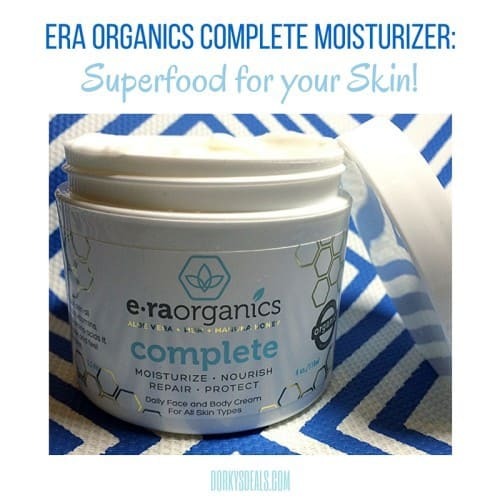 I am very pleased with Era Organics Complete Moisturizer and I would recommend it without hesitation, especially to those who also have dermatological conditions and sensitive skin. Your skin will thank you. Plus, you can try it risk free thanks to Era Organics' 60 day money back guarantee. If you aren't happy simply contact the company for a refund. You can purchase Era Organics Complete Moisturizer on Amazon here. Plus, for a limited time, you can save 25% by entering the code DORKYS25 at checkout! It looks thick and creamy. I would not mind trying it out. I need to get some for my husband who has the same skin problems you have. The ERA organics moisturizer sounds wonderful, and I love the ingredients. I’d like to try it!